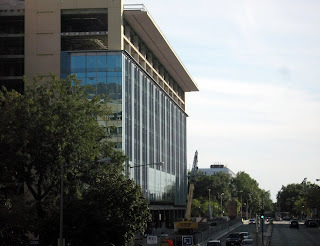 In Tuesday's Biznow, there was an article about the progress being made at Constitution Center, located at 7th & D Street. David Nassif Associates is in the process of a $275 million renovation after the US DOT moved out in 2007. Construction is being led by Davis Construction and SmithGroup architects. The building has been stripped to its frame and is being rebuilt, with renovations scheduled to be complete by early 2010. As you can see from the above photo I took back in mid-October, most of the curtain wall has been installed along 7th Street. An entrance to L'Enfant Plaza Metro is located at the site and reopened on July 1st of this year - one year after renovations began. The article describes the superlatives involved with this construction project: "Largest privately owned office building in DC - by about 200%. 1.4M SF above ground, 690k below. Largest privately owned parking garage in DC. Largest private office building renovation in the US to be LEED Gold (pending). Most energy efficient office building in the District." A private one-acre courtyard will be built as well. Constitution Center is currently available for lease, but since it's being built as a Level IV security-rated facility, it will most likely attract federal tenants. Too bad no ground-floor retail is planned at this massive office complex, but mixing commoners and secure tenants wouldn't fly at a Level IV facility.